I love adding a handmade touch to my gift packaging at Christmas time. I have a hard time tying bows, so I usually try to add some sort of handmade gift tag. 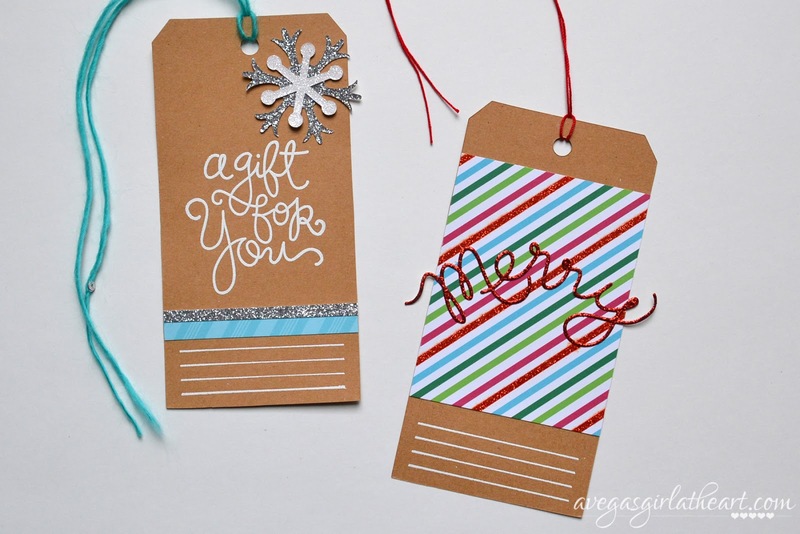 Last year, I used my printable digital gift tags and tied them with twine around my packages. This year I thought I would try to use items from my stash, some older and some newer, and start my gift tags early. If I can get them done in November, I'll be ready to wrap gifts come December. I usually use around 90 tags, so I'm going to try to plan out a little schedule of how many to complete each week over the month of November. I decided to use 8 designs this year, varying the colors and papers used to mix things up. By keeping to just 8 designs that I have planned out in advance, that will keep things a little simpler as I work through making these tags. I'm using scraps, dies, lots of heat embossing, and just a few stamp sets. My goal was for the tags to be coordinated by using one main stamp set throughout. My tags were cut from kraft card stock using the Tag and Bookplates die from Tim Holtz. These are large tags, so they'll go on my medium to large packages. I'll be doing a smaller version of these (likely using a punch or tags cut with my Silhouette) for smaller packages. For every tag, I used the lines from the Envelope Sentiments stamp set from Simon Says Stamp. I stamped the lines in Versamark, then added Stampin' Up! white embossing powder and heat embossed them. This will allow me to write a 'to' and 'from' on each tag. On the tag on the left above, I used the large 'a gift for you' stamp in the center, also heat embossed with SU white. I added strips of patterned and glitter paper above the lines, and then I die cut some snowflakes out of glitter paper using the Stampin' Up! Bigz Snow Flurry die. On the tag on the right, I simply added a large piece of patterned paper, and die cut 'merry' from red glitter paper using the Stampin' Up! Expressions Thinlits die. I liked that the 'merry' was curly, similar to the handwritten stamps in the Envelope Sentiments set. The tag with the mittens was a fun one to do. I stamped snowflakes from the Neat & Tangled Falling Flakes stamp set, using Versmark and SU White and heat embossed them. Then I stamped and heat embossed mittens using The Stamps of Life's Christmas2build stamp set. I die cut them using the matching dies. Next I stamped the 'open me a.s.a.p.' from the Envelope Sentiments set, heat embossed it, and die cut a present shape around it using the Sizzix Triplits Gifts dies. I added the mittens over the present so it looked a little like someone was carrying the present. 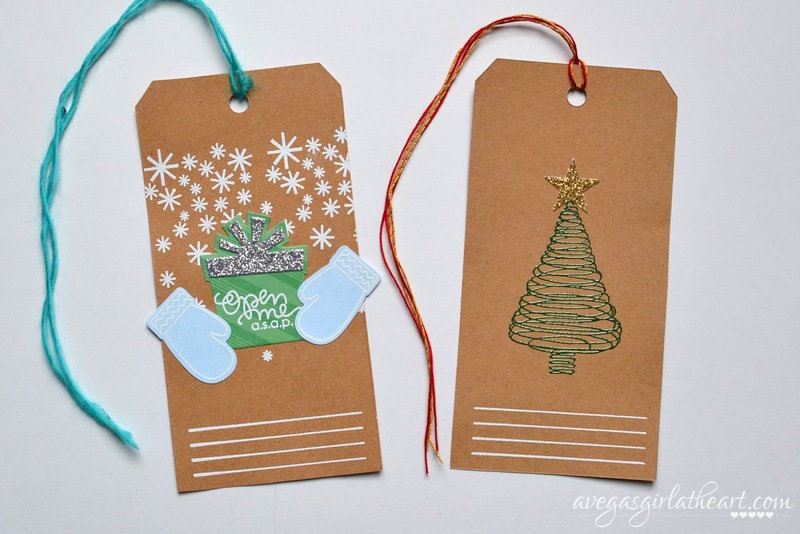 For the tree tag, I simply stamped and heat embossed an older tree stamp I had. I used Stampendous Pearlustre Emerald embossing powder, which heats to a really smooth beautiful foresty green color. Then I punched out a gold glittered star using a Fiskars punch. 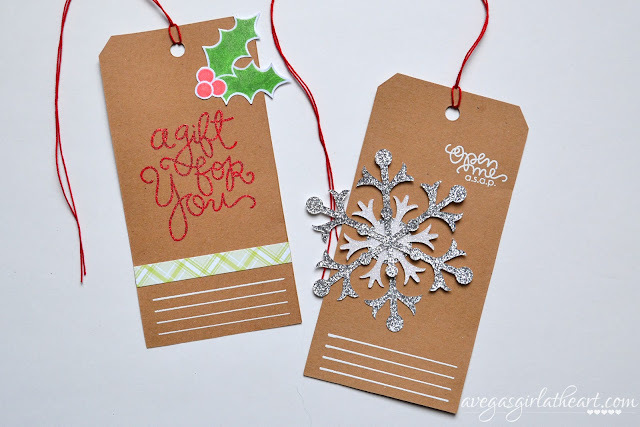 I used Stampendous Red Tinsel embossing powder on the tag above on the left. It's so sparkly! Next, I stamped the holly leaves using The Stamps of Life's holly4Christmas stamp set onto white card stock, and heat embossed with Recollections clear embossing powder. I did this because I wanted to color in the berries and leaves with my Wink of Stella brush pens, and the clear embossing acts as a resist, so my colors didn't bleed. Then I very carefully cut them out, and added them to the tag. 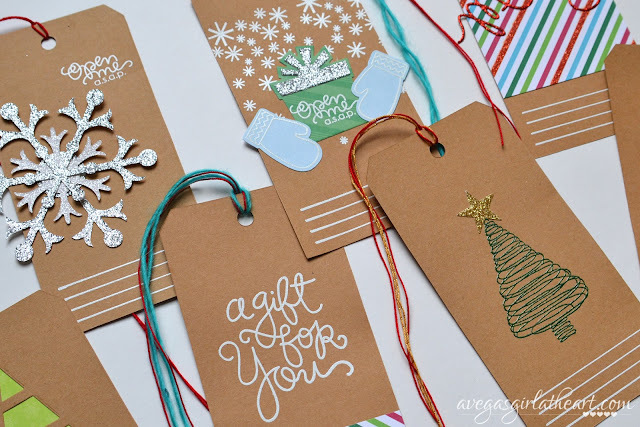 On the tag on the right, I die cut more snowflakes using the Bigz Snow Flurry die, and stamped and embossed that 'open me a.s.a.p.' again in the upper right corner. 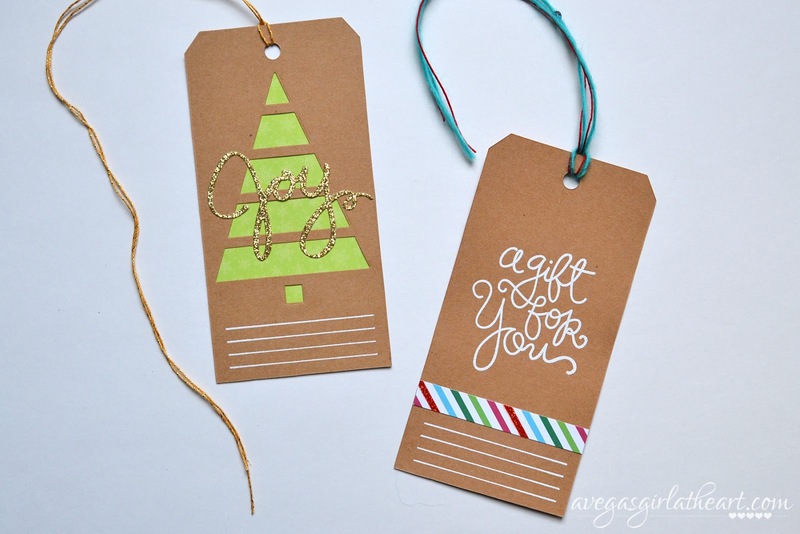 The tree tag was done using the Christmas Tree Cutout die from My Favorite Things. I just added a piece of patterned paper behind the tag, and I also attached another of the kraft tags behind it, so that the paper won't show. 'Joy' was die cut from gold glitter paper using the Stampin' Up! Wonderful Wreath Framelits dies. Finally, the tag on the right above is super simple - just a strip of patterned paper and that same 'a gift for you' stamp, embossed with the SU White powder. 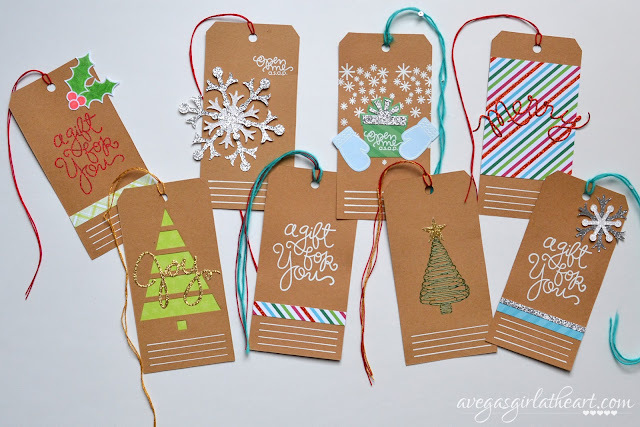 I am pretty sure I can do these in batches - die cut all the tags, do all of the lines, then do one style of tag several times before moving on to the next. It is good to have all the designs picked out though, because that's usually where the most time is spent for me, trying to come up with what I want my tag, card, page, etc, to look like. And these were really fun to work on, because I got to use older supplies and do a lot of heat embossing, which isn't something I do that often. Do you guys add handmade touches to your holiday packaging?